Item Costing is a powerful feature in the Operations Module of Restaurant365. This document gives a high level of each type of record you must create / update in order to use the many functions within Item Costing. Vendor records can be created via the R365 Setup Assistant, the Import Tool, or Manually. To manually create a Vendor, hover over the 'Vendor' menu and select 'New Vendor'. A blank Vendor record will open in a new tab. Complete all the required fields on the Vendor record as outlined on the Vendor record article. Ensure that each Inventory Vendor has the 'Entry' type set to 'by Item' and complete the Vendor creation process. U of M records can be created via the Import Tool, or Manually. To manually create a U of M, hover over the 'Item' menu, then the 'Setup' sub-menu and select 'New U of M'. A blank U of M record will open in a new tab. U of Ms are used to designate how Items are Purchased and Counted (such as 18oz bottles, Case of 4 gallon cans, lb, OZ-fl, OZ-wt, etc.) There are 3 Base types of U of M. The Base types are used to help find common denominators to know how one U of M relates to another. The system comes with a pre-set list of standard Units of Measure. If the desired U of M is not in the list then create a new one and set the following fields. The Equivalence helps the system determine how a U of M relates to another. To set this up specify an Equivalent U of M and Equivalent Qty. Equivalent Qty is set to '8', because a Cup contains 8 fluid ounces. A U of M can only be set as equivalent to a U of M of the same Base type. So you wouldn’t be able to say lb = 16 OZ-fl because 'OZ-fl' is Volume and 'lb' is Weight. While that equation is true for water it isn’t true for other substances like gold (or flour if you don’t have much gold in your restaurant). This article will describe how to create your Purchased Items. Purchased Item records can be created via the Import Tool, or Manually. To manually create a Purchased Item, hover over the 'Item' menu, then the 'Setup' sub-menu and select 'New Purchased Item'. A blank Purchased Item record will open in a new tab. Default Purchase U of M: This field is required and designates the default unit of measure this item is purchased in. This can be set for individual vendors on the vendor item record if desired. Manual: This is the default and means the item cost will be updated by the end user either when entering stock counts, or by opening the Item or Item Location record and setting it. Auto Update Avg Last 3 Invoices: As the name describes this will auto update just as the Auto method but it will average the 3 most recent invoices instead of just the most recent. This tab is used for Purchased Items where different U of M Base types are used on the same item. The Base types are Volume, Weight, and Each. For example, an item might be purchased in gallons but counted in pounds. If so then of U of M Equivalence must be setup for that item. This section allows that by specifying a Weight Qty of Weight U of M = Volume Qty of Volume U of M.
The next step is to create Item Locations for your Items. 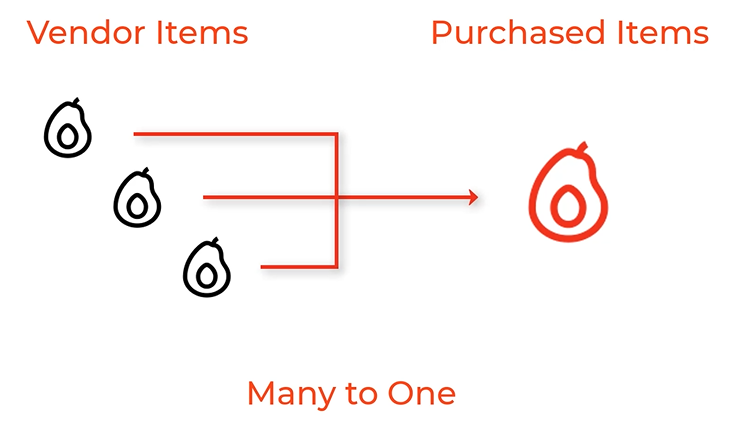 Item Locations allow you to track the cost of your inventory by Location, or rather, each Location will have a different cost value for each Item. This is extremely useful if you have costs that vary significantly from one Location to another. Item Location records can be created automatically on the Purchased Item record, via the Import Tool, or Manually. To auto-create Item Locations, open a Purchased Item record that has previously been saved, then navigate to the the 'Item Locations' tab and click the 'Create for all Locations' toggle. An Item Location record will be created for each Location in your R365 database. You can manually delete un-needed Item Locations by clicking the trashcan icon on the respective Item Location row. To manually create an Item Location, hover over the 'Item' menu, then the 'Setup' sub-menu and select 'New Item Location'. A blank record will open in a new tab. Vendor Item records can be created during AP Invoice Entry, via the Import Tool, or Manually. Refer to the Vendor Item article for more information on how to create Vendor Items via AP Invoice Entry. To manually create a Vendor Item, hover over the 'Item' menu, then the 'Setup' sub-menu and select 'New Vendor Item'. A blank record will open in a new tab.